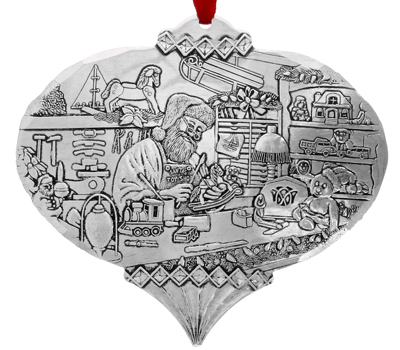 Perfect for any Christmas tree, these fine metal ornaments are hand forged by Wendell August Forge and are heirloom quality pieces. 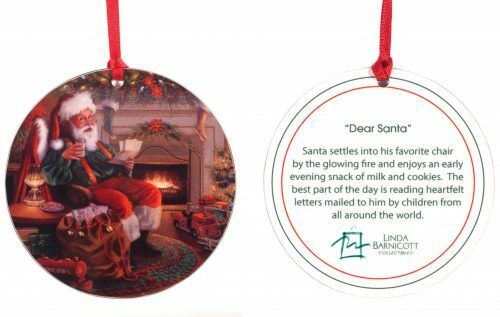 Each of Linda’s paintings are re-created in a 3” round ornament hung with a satin red ribbon. They are vibrant, lightweight and scratch resistant. This item is easy and safe to ship. At Christmas time, snowmen have been known to come alive. Santa is all too familiar with the magic that creates it. It is the love, put into these creatures, that makes them real for all of us in our dreams at Christmas. Santa Claus puts the finishing touches on a rocking horse for a special little child. 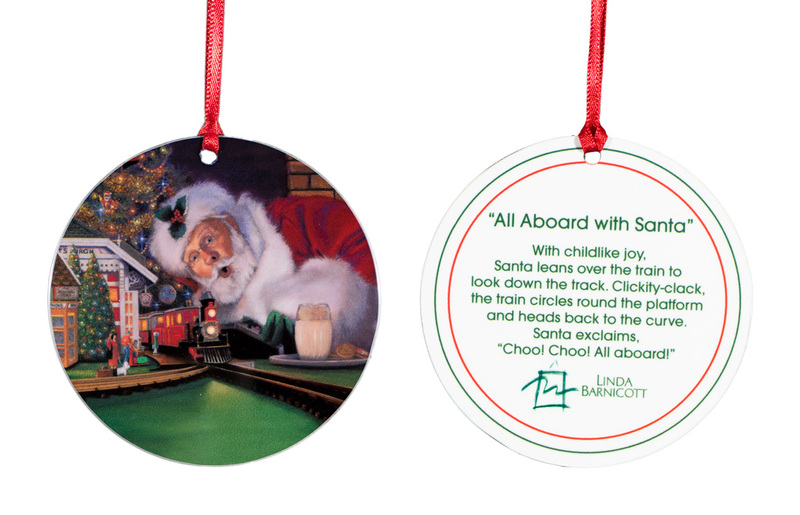 Thinking of the joy on that child’s face on Christmas morning, Santa smiles. 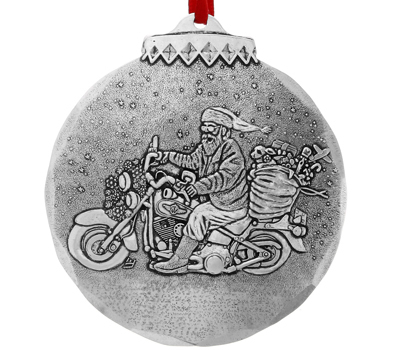 Santa soon discovers that riding a cool motor cycle is a great diversion from his sleigh. As he speeds through the night, snow flies, toys take flight and even the little puppy holds on. Once a year Santa trains up his youngest reindeer to eventually fly his sleigh. 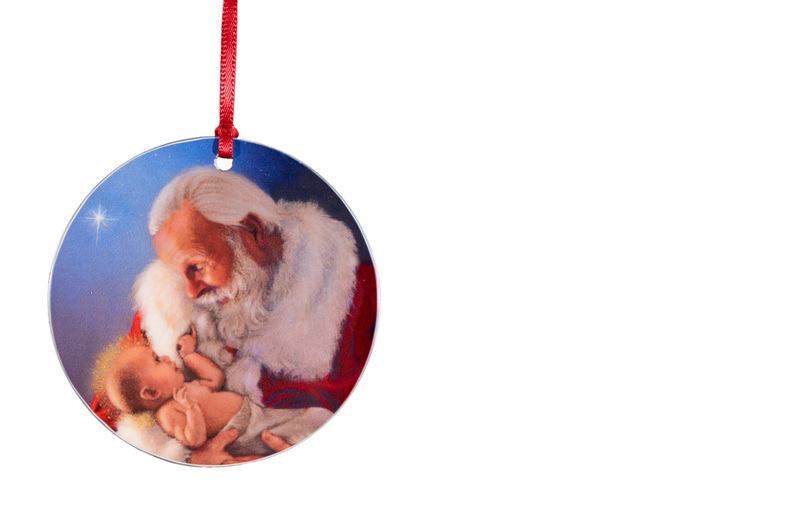 Imagine Santa’s delight at this little token of tenderness as the little fellow licks Santa’s face. 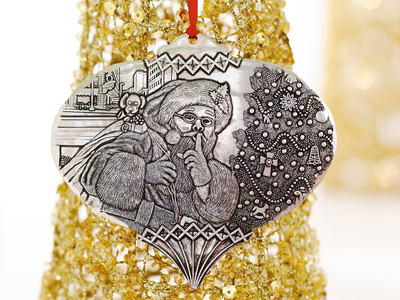 “Shhhh!” takes you back to your early childhood with dreams of Santa. He is jolly, warm, has rosy cheeks and wants nothing more than to make every little child glad. Enjoying the panoramic view of Pittsburgh from the Duquesne incline, residents and guests alike marvel at the beauty of the holiday season in Pittsburgh. Revisit a magical time in the wintry life of Pittsburgh. It warmed our hearts to see the wondrous windows when we were children and meeting our loved ones under Kaufmann’s Clock too! 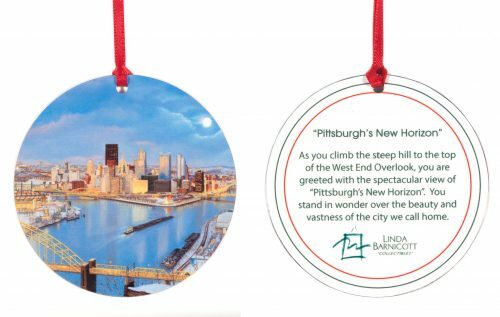 As you climb the steep hill to the top of the West End Overlook, you are greeted with the spectatcular view of “Pittsburgh’s New Horizon”. You stand in wonder over the beauty and vastness of the city we call home. Celebrate the holiday season in Pittsburgh when the city is aglow with shimmering lights – especially the beautiful tree at the Point. Pittsburgh truly becomes a winter wonderland in the snow. 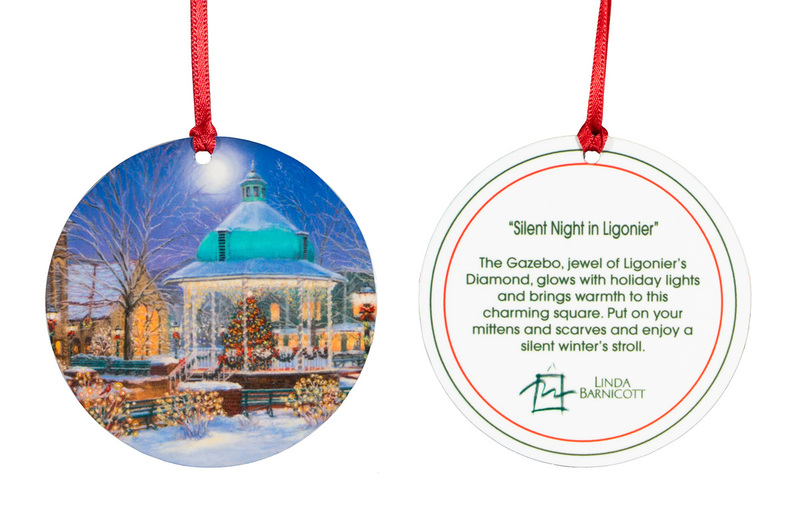 The Gazebo, jewel of Ligonier’s Diamond, glows with holiday lights and brings warmth to this charming square. Put on your mittens and scarves and enjoy a silent winter’s stroll. Walk into a timeless setting where a cool drizzly rain awakens memories of days gone by and dreams yet to come. 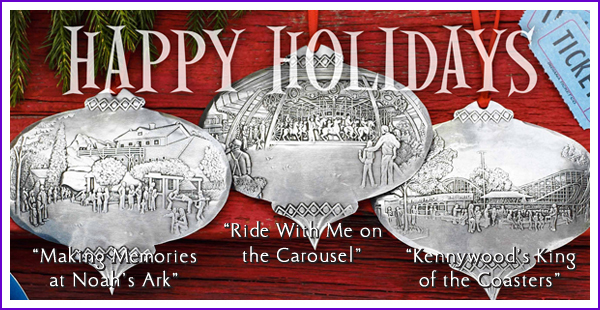 Introducing the newest ornaments by Linda and Wendell August Forge. 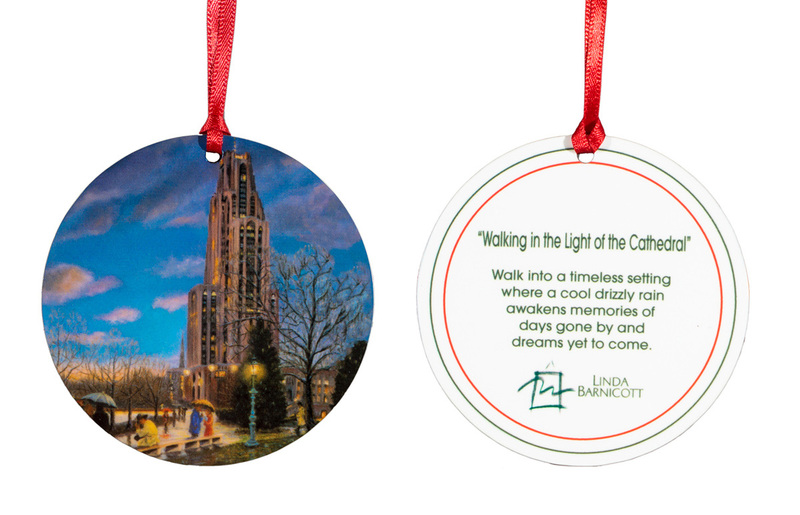 This year’s ornaments are designed by Linda and handmade by Wendell August Forge craftsmen in their Pennsylvania workshop. 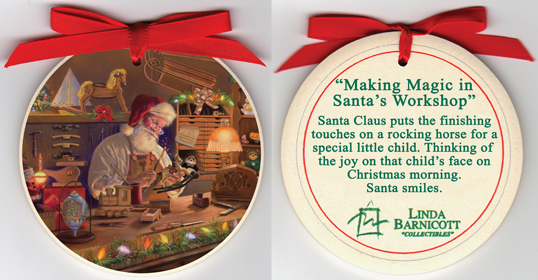 This first ornament features Linda’s newest painting in her Jolly Old Elf series, “Making Magic in Santa’s Workshop”. 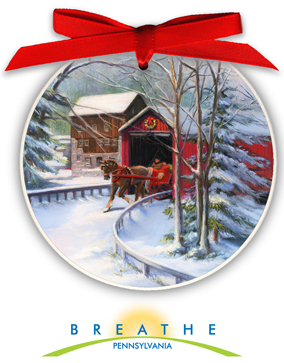 The second ornament for 2017 features the whimsical print, “Santa’s Joyride”. 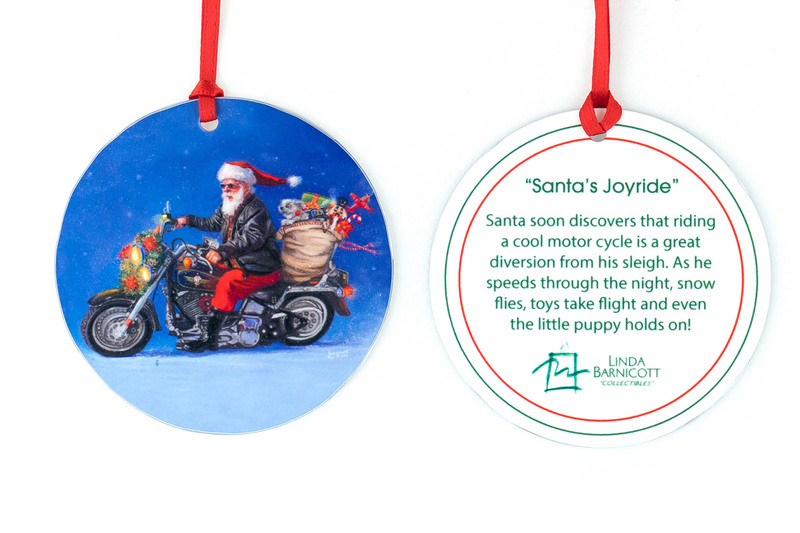 This fun ornament is the perfect gift for any Harley lover or motorcycle rider. 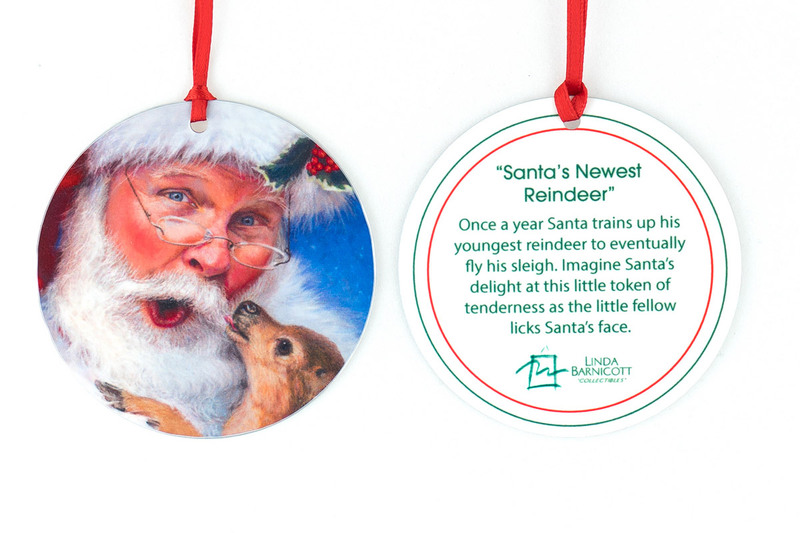 The second ornament unveiled by Linda and Wendell August Forge features the companion print to “Shhhh!”, “Santa’s Newest Reindeer”. 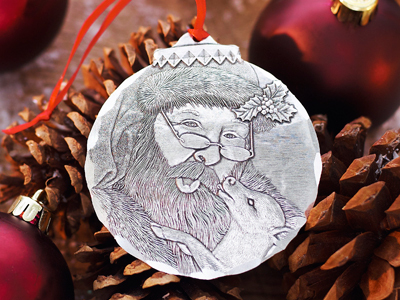 Wendell August Forge and Linda are going to produce aluminum ornaments of the entire five-year Jolly Old Elf series so why not start your collection now! 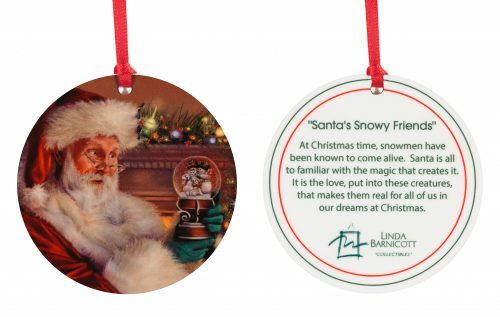 Linda and Wendell August Forge recently unveiled two new hand-crafted aluminum ornaments, featuring Linda’s Jolly Old Elf series of paintings, for the 2016 holiday season. 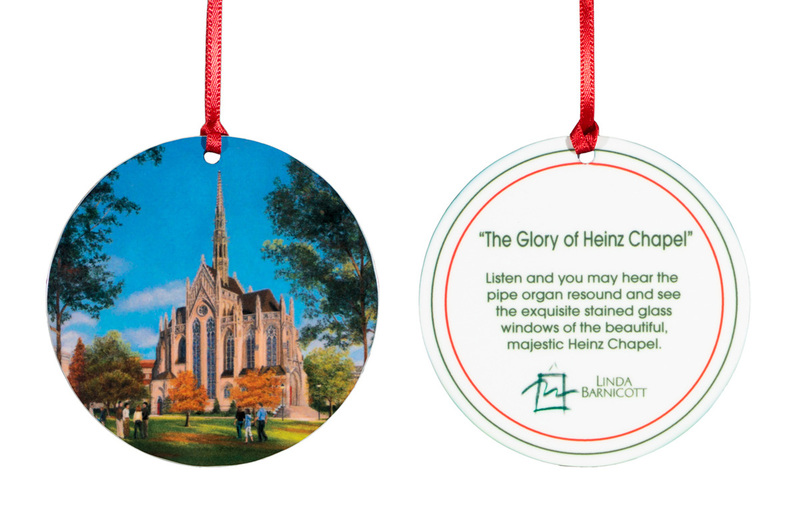 The first ornament features Linda’s first painting in the series, “Shhhh!”, and will be a charming addition to your holiday tree or a great gift for someone special. 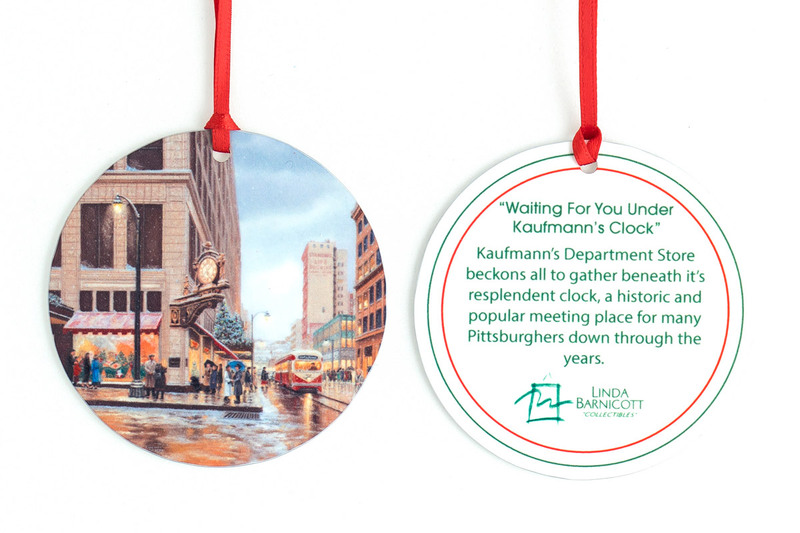 The artisans of Wendell August, America’s premier metalcrafters, have partnered with Linda to create another captivating limited edition ornament collection for 2014, highlighting the best of her paintings of the city of Pittsburgh, Pennsylvania. 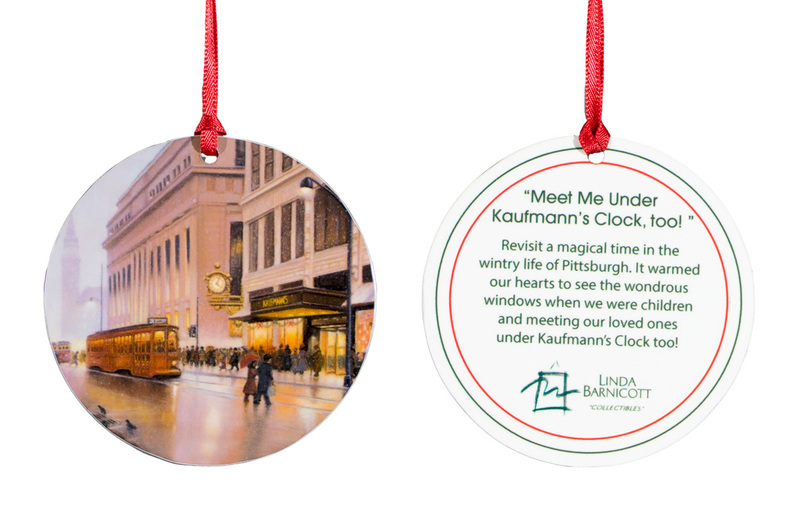 The artisans of Wendell August, America’s premier metalcrafters, have partnered with Linda to create a captivating limited edition ornament collection for 2013, highlighting the best of the great city of Pittsburgh. 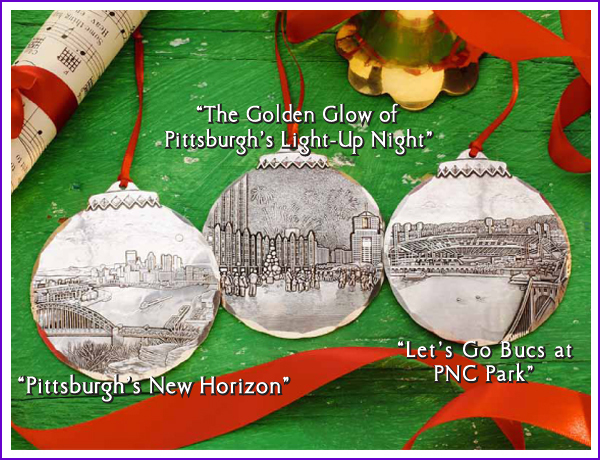 Wendell August Forge, maker of heirloom-quality personalized metal gifts that commemorate life’s special moments, has partnered with Linda for the third year to create the 2012 collection of Pittsburgh-themed ornaments elegantly hand-crafted in aluminum. 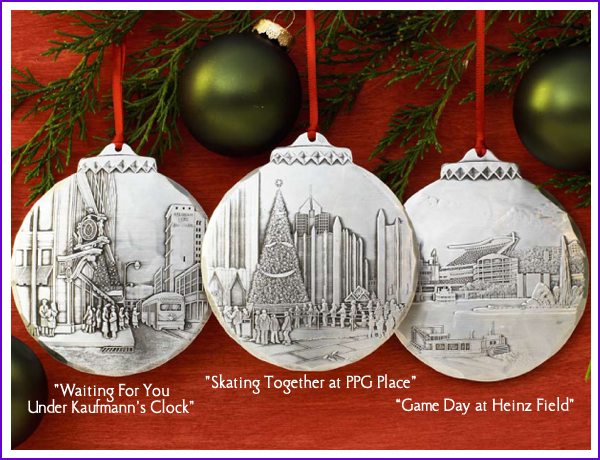 Now in year two of their five year collaboration, Wendell August Forge and Linda announce the unveiling of these three new hand-crafted aluminum Pittsburgh-themed ornaments from the 2011 series. 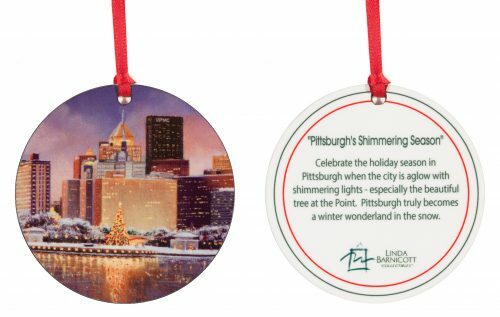 Wendell August Forge, maker of heirloom-quality personalized metal gifts that commemorate life’s special moments, has partnered with Linda to create this new collection of Pittsburgh-themed ornaments elegantly hand-crafted in aluminum. 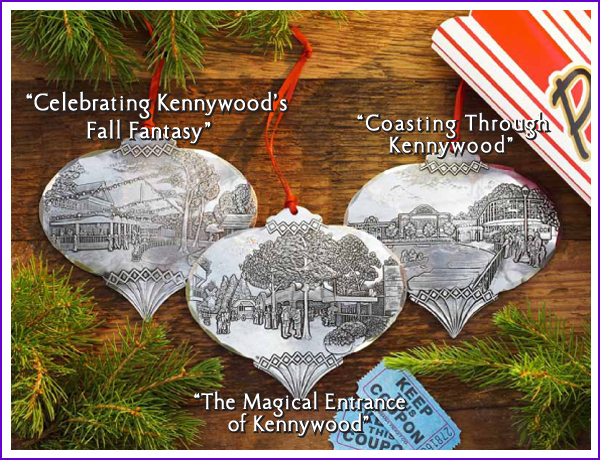 Wendell August Forge, maker of heirloom-quality personalized metal gifts that commemorate life’s special moments, has partnered with Linda for the fifth year to create this 2014 collection of ornaments that celebrate the history, magic and fun that is Kennywood Amusement Park. 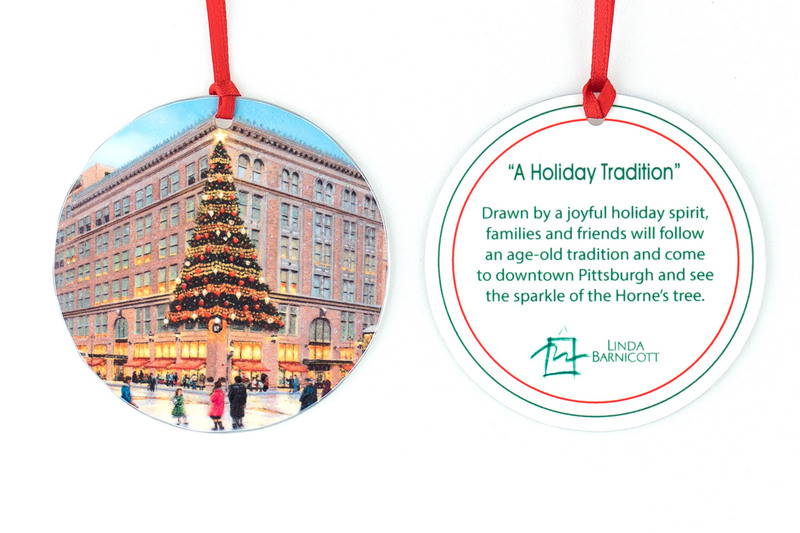 Drawn by a joyful holiday spirit, families and friends will follow an age-old tradition and come to downtown Pittsburgh and see the sparkle of the Horne’s tree. Market Square charms our hearts as we enjoy the magnificent crystal tree. Join families and friends as they experience the beauty of fireworks lighting up the Pittsburgh sky each November. 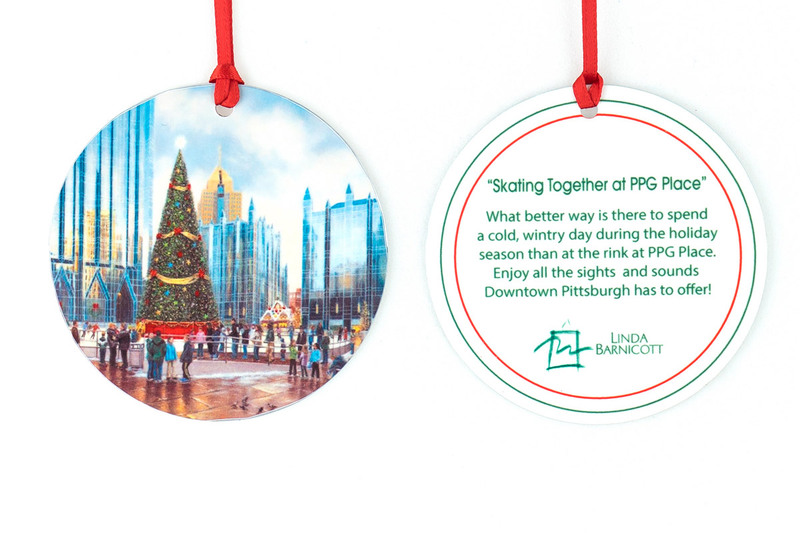 What better way is there to spend a cold, wintry day during the holiday season than the rink at PPG Place. 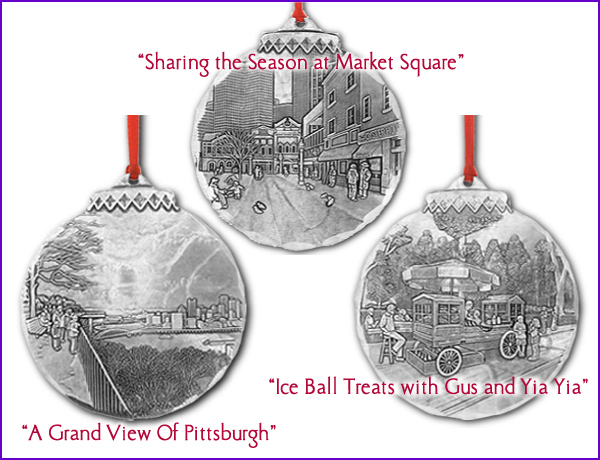 Enjoy all the sights and sounds Downtown Pittsburgh has to offer! Kaufmann’s Department Store beckons all to gather beneath it’s resplendent clock, a historic and popular meeting place for many Pittsburghers down through the years. 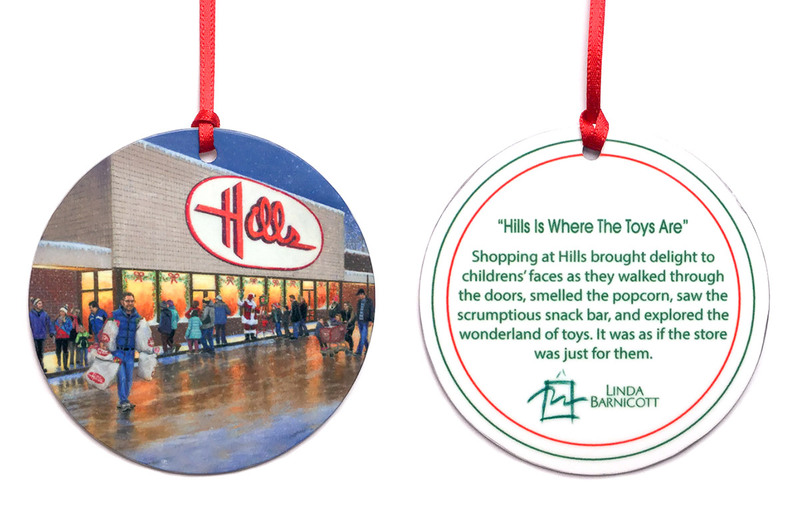 Shopping at Hills brought delight to children’s faces as they walked through the doors, smelled the popcorn, saw the scrumptious snack bar, and explored the wonderland of toys. It was as if the store was just from them. On a warm, gentle summer day the sweet fragrance of beautiful flowers beckons. 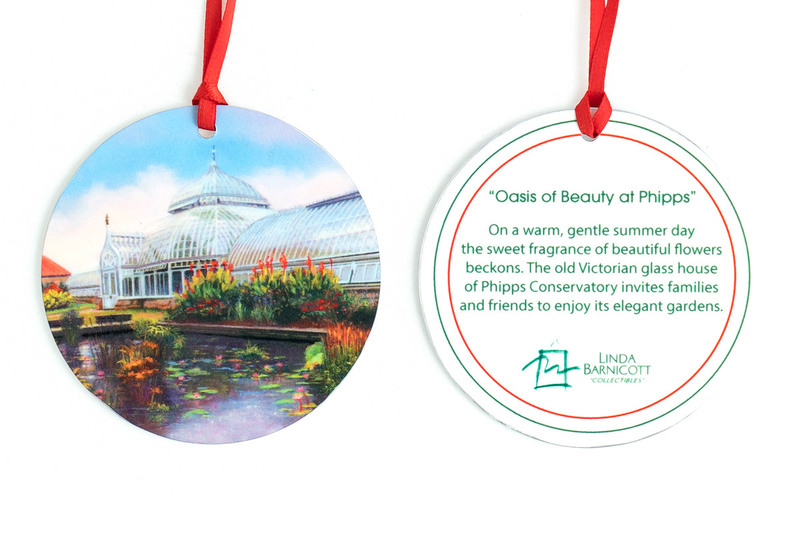 The old Victorian glass house of Phipps Conservatory invites families and friends to enjoy its elegant gardens. 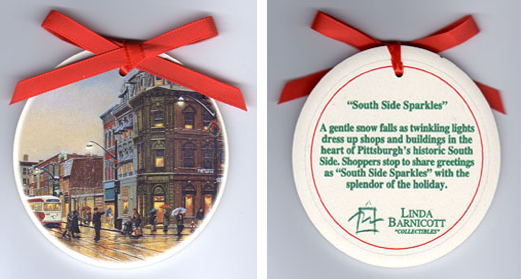 A gentle snow falls as twinkling lights dress up shops and buildings in the heart of Pittsburgh’s historic South Side. Shoppers stop to share greetings as “South Side Sparkles” with the splendor of the holiday. On a warm early evening traveling across Pittsburgh’s beautiful rolling hills, folks of all ages enjoy the gentle sway of the streetcar as it returns them home. Crossing Slippery Rock Creek at McConnells Mill, this romantic covered bridge takes you back to a bygone era when life was as fresh as newly fallen snow. 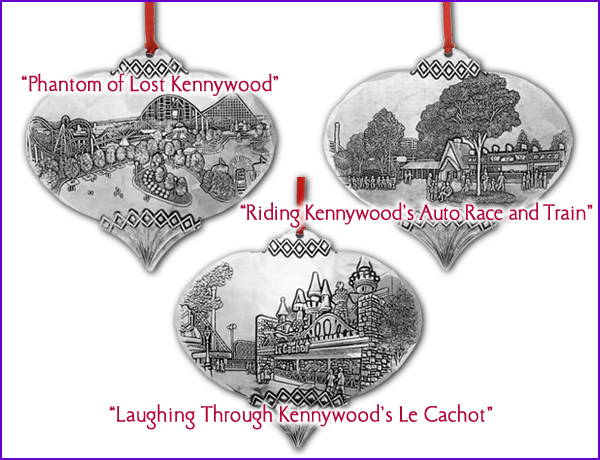 This newly released ornament recalls an electrifying ride on Kennywood’s Thunderbolt. 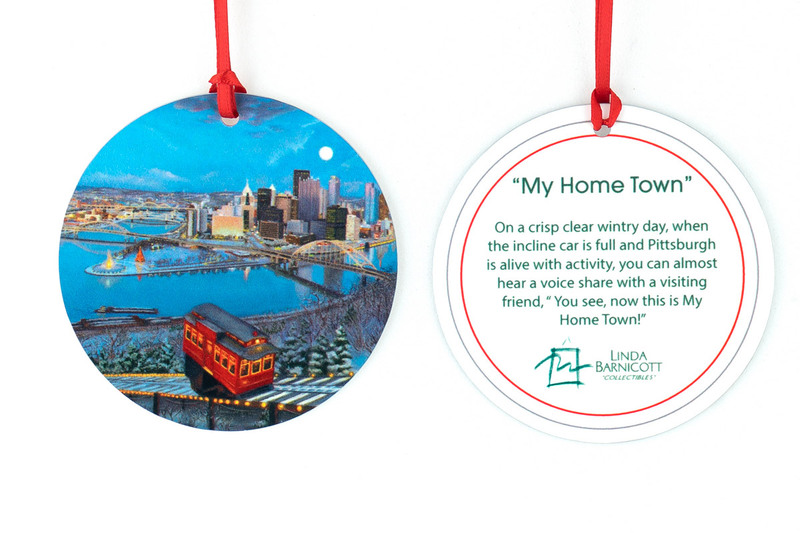 Enjoy a spectacular view of Pittsburgh from the hills of the West Endwith this new holiday ornament from Linda Barnicott.Capture warm smile and childhood giggles with this special ornament featuring one of Linda’s first painting. Heinz Field roars to life whenever the black and gold take the field. 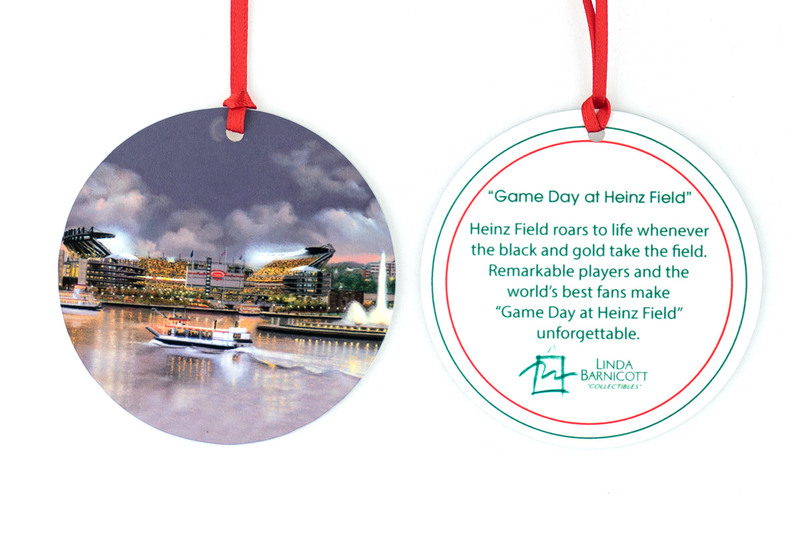 Remarkable players and the world’s best fans make “Game Day at Heinz Field” unforgettable. 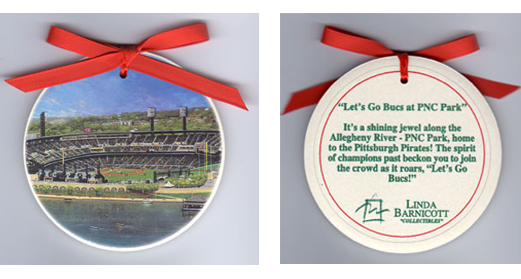 Celebrate one of Pittsburgh’s newest landmarks with this holiday ornament featuring Linda’s exciting painting of PNC Park! 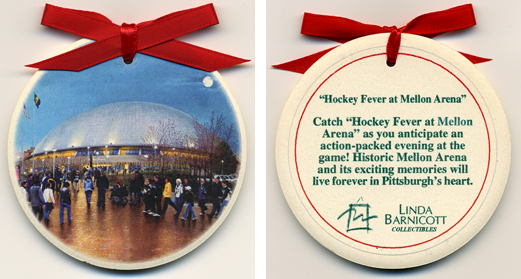 Catch “Hockey Fever at Mellon Arena” as you anticipate an action-packed evening at the game! 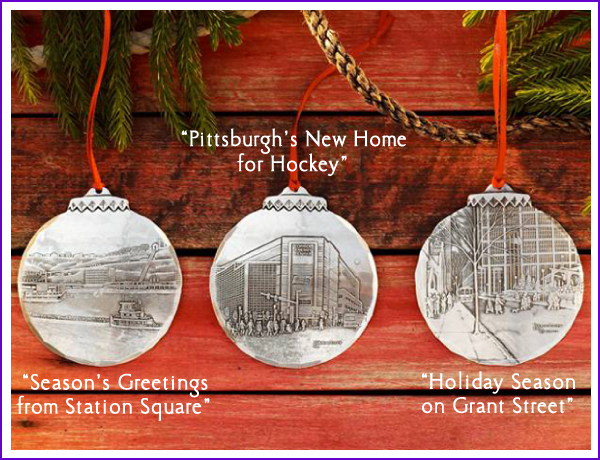 Historic Mellon Arena and its exciting memories will like forever in Pittsburgh’s heart.